It hasn't been confirmed on the CDC website, but rumor has it there is some sort of virus going around that makes people put their favorite classic car body on top of a V8 powered tube frame. The thrice painted BMW 2002 Cobra featured last month has a competitor for the "what is hiding under that sheet metal" trophy. 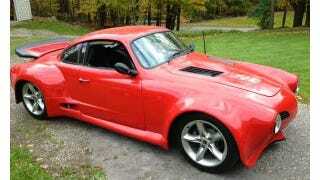 Find this 1967 Volkswagen Karmann Gia Type 14 with Covette Suspension & Ford 5.0 V8 for sale. It looks like a seriously tubbed/flared Karmann Ghia and retains little of the original Volkswagen parts and is riding on some kind of tube frame chassis and a C4 Corvette suspension. DT Commenter Mark Geoffriau made the astute comment: Looks like a 911 Turbo that got stung by several hundred wasps. Power comes from a Ford 5.0 liter V8 mounted up front and probably putting out around 300-325 horsepower. Power gets put to the Vette rear end via a Borg-Warner T-5 manual transmission. The passenger compartment has little in relation to a normal Ghia because just about every part needs to be custom fabricated when dealing with something this insane - and the inside bears a striking resemblance to the BMW 2002 Cobra. Originally posted as DTO: Gila Monster: 1967 Volkswagen Karmann Gia Type 14, Vette Suspension, Ford 5.0 V8 on Daily Turismo.